It looks like it is gonna be a habit for me to take a week off from work in spring just for bonsai purposes. Last week was my 2nd holiday of this kind and half of it was used as intended, then the weather got worse. Much worse. But I managed to do most of the work I planned, except collecting one old wisteria from parent´s garden. It started there actually, I removed some 5 trees in various stages of development and planted them in my garden for a few more years. But one birch that was planted there 3 years ago got it´s own slab and I improvised a quick landscape that will probably change a bit over time. It was collected in my early bonsai days with the intention to copy Harry Harrington´s hawthorn raft, but it only grew one single branch, that became a new trunk over those 3 years. I wanted to leave it in the garden but after ocassional pruning it started to look like there is some potential so I collected it and planted on a slab. Another day I had my eyes on a very old lilac that grew in my grandparent´s (now mine) garden for over 50 years I guess. It was planted just by the fence and the well so I couldn´t get to the roots on that side, so after over an hour and 2 t-shirts soaking wet it was time to call for help from my father and we pulled it out with his custom home made tractor. Day 3 - collecting in the old orchard that is full of hawthorns these days. I had one selected there and it was quite easy getting it out - compared to the old lilac. And then the day came that I was looking forward to the most since autumn, when my friend asked me if I wanted any of the trees from her garden that she is gonna get rid of to make a place for some tulips. I couldn´t believe that one of them was chinese cork bark elm - not a usual tree in slovakian garden. But her sister used to work in a supermarket and planted some of the mallsai they sell in the garden, and this one took off surprisingly well. I already collected one japanese maple from there last year, but this elm didn´t caught my eye. It was over 6 metres tall and looked like any other large tree in there. Anyway, my friend couldn´t wait till I go and collect it so she and her brother in law sew the upper part off in autumn already, therefore I don´t have any pic of the whole tree. 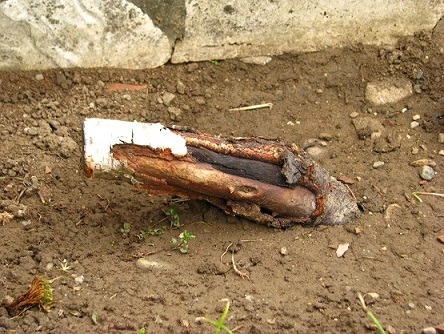 It didn´t have a tap root but rather very thick side roots and I needed to use a chainsaw to cut them. Here are the pics after collection and after lowering the trunks next day. One more tree was to be collected in that garden, Cotinus coggygria was it´s name I was told. I have only the pics after the collection, but ít was lowered as well the next day. Wisteria was on schedule the next day, but it started to rain and 2 days later winter came back with full force. Temperatures fell down to -15 at night and wind did quite a lot of damage in a nearby city. But I believe my new acquisitions will be ok, they now reside under a piles of snow that protects them from freezing temperatures. I cannot wait for this cold spell to be over and hopefully spring will finally come after this. Nápad. Dáme dohromady tvojí břízu s typickým maskuliním znakem a mojí jablůňku s uro vaginou sorry oprava: dutinou. Tahle dvojka bude k neporažení. Konečně jsi se propracoval ke správné velikosti stromků. Ten jilm je fakt super. Čo sa týka veľkostí - pre mňa má každá svoje čaro.